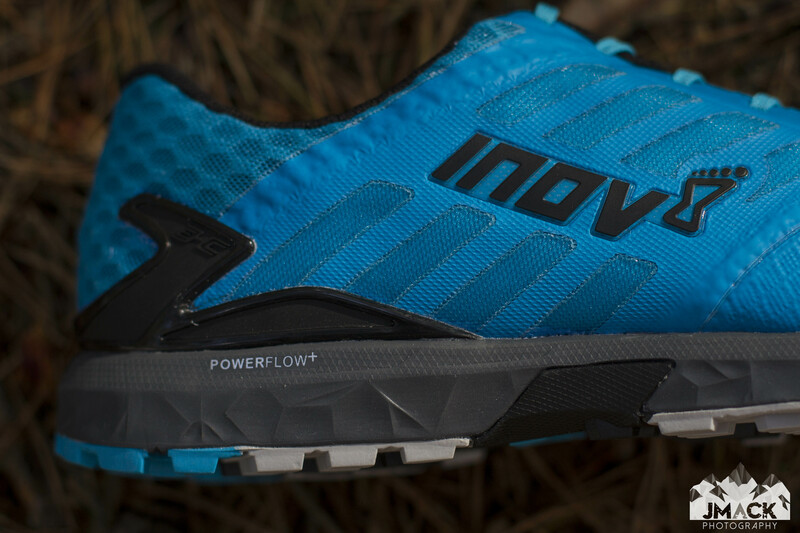 Designed primarily for hard and rocky trails, I’ve found in my running, a much broader range of trails are able to be tackled in inov-8‘s new Trailroc 285. I was fortunate to use both a pre production and stock pair, which has allowed me plenty of time on the ground and a chance to try both colours (I’m all for the grey & green). In keeping with inov-8’s tradition, the number designates the weight of the shoe, with the rear two triangles (see below shot of heel cup) signifying an 8mm drop. If you want a marginally lighter, but lower drop version, the 270 comes in at 4mm… but is 15g’s and 4mm too much extra to handle? First off, forget the stated weight, quantifying how this may or may not effect your running isn’t easy and in my personal opinion, has little value. Try them on and you know what’s going to work. The upper mesh is light and breathable, yet kept sand from my local trails and grit from the lakes firmly outside. It’s worn well, aided by the welded over lays, with the gusseted tongue doing a stellar job working with the mesh. The tongue itself is thin and pliable, in many respects it feels more like the upper. Around the toe cap inov-8 have utilised a TPU toe bumper for protection, and it works. Believe me. When in the Langdales in November, I gave many a rock a good kicking, and despite my best efforts, my feet remained in tact, even if the rock still stood in perfect situ. Thumbs up for this feature, until you engage with it, you are unaware of it’s presence. The laces do their job well and work in tandem with the MET-CRADLE+, otherwise known as that black and tonal grey/blue bit across the arch. Support in this area is something I really do benefit from in a shoe and the TrailRoc 285 has this in spades. To bolster the heel lock, on the rear inov-8 have used their EHC or External Heel Cage to lock you in. As aggressive, OTT and potentially restrictive this may appear on first glance, without looking at a spec sheet I wouldn’t know it was there. It didn’t feel like I was superglued in or my ankle was restricted compared to other shoes, namely the Sense Ride, but nor did it let go. This could well be a feature that quietly goes about its business, not aiming to seek attention, rather humbly performing its duty in the background. The true test would be a 285 without it…. I have no complaints about the upper, it’s comfortable, hardwearing, locked me in and kept crud out, even on the wettest of days in the fells. Grip and Ride. Two things a hard pack rock shoe must excel at. After all, the terrain is less forgiving, you may be travelling on average faster and with this, being surefooted is king. As is all too clear from these two shots there are lugs a plenty! These 4mm tall micro cleats are everywhere, and provide reliable traction at which ever degree you plant your foot at. Constructed from three blends of rubber, the black area is a super soft compound for maximum grip, whereas the grey outer lugs are a medium compound to balance grip with durability. Given I wear my lateral edge out first, this has boded well to increase the lifespan of the sole. For the arch and heel plate, a hard sticky compound has been added, for these extra high wear areas, especially if you are scrambling over boulders or bombing down a technical descent. In practice I’ve used the TrailRoc for lengthy runs in sand and mud, speed sessions on a blend of rocky tracks and singletrack, right through to open fell. It was the latter which surprised me the most. Away from rock, on saturated tussock covered fell, I wasn’t moving like bambi on ice and until things got deep, they held their own. On faster trail/fireroad sections, the combination of a progressive midsole and footbed kept things rapid. They want to shift. Yes, the 270 is the faster version by definition, but if you want the extra stack height for longer sessions or races, I personally don’t feel you will be handicapped. They are responsive, have a kick and want you to test limits. On rock they do what they set out to, providing grip, with the stubby lugs providing an ample contact area to generate solid friction. The compound does provide traction and has worn well all things considered. To go with the midsole, inov-8 have thrown their 5th generation Meta-PLATE in for good measure. 4 generations must have paid off, as despite some interesting efforts, my foot remained serviceable on some nasty rock descents. On top of a top notch midsole, the shoe remains flexible, a inov-8 trait they have carried since day 1. This in turns helps you maximise grip and perform a more natural gait cycle. I have been happily surprised with the TrailRoc 285, they let you rip the trail up, yet can happily plod, even if deep down they are urging you to push the tempo. So 285 or 270? I think the key number is 4mm vs 8mm, as in reality that is what you are looking at. Work out your stack preference, try both on and don’t let the figures mess with your mind. They will be on my feet for the coming months and I’ll be better placed to shout out if anything changes. A regular in my personal rotation outside of review products, I’ve been impressed. Now, I need to some hard rocky trails to let them perform to their optimum. Hi James, any thoughts on the comparison between the Trailroc 285 and the Salomon Sense Ride, particularly with a view to ultras? Also I’m stepping up from 50 milers to running TDS this year. In the past I’ve used Nike Terra Kigers for 50’s, which are fine for me in terms of cushion / drop, but a lot of people that I talk to suggest that as the distances go up from 50miles your feet get punished and want more cushion / drop. Do you think that the Trailrocs / Rides might be a bit minimal after 120km?